The proliferation of modern four-strokes has changed the dirtbike world in a profound yet very subtle fashion. We take today’s high-winding four-stroke MX and off-road engines for granted simply because they have been in the mainstream for nearly 15 years. Today’s thumpers are amazing examples of modern engineering. Technology has made them cleaner, more powerful and easier to ride than the two-stroke machines that dominated the marketplace from the mid-1960s to the end of the millennium. That’s the upside. The downside is that modern four-strokes are also complex and very expensive to maintain. The addition of valves, valve springs and cams has only added to the list of parts that need to be replaced at each major service interval, and adding two more piston strokes to the combustion cycle has done nothing to increase their TBO (time between overhaul). Yamaha’s YZ250 (left) and YZ125 (right) are back and better than ever in 2015. A styling makeover and fresh suspension components are keeping the Blu Cru’s two-strokes viable in a four-stroke-dominated dirtbike world. Thanks be to Yamaha, then, for being the only Japanese manufacturer not to abandon two-strokes altogether. 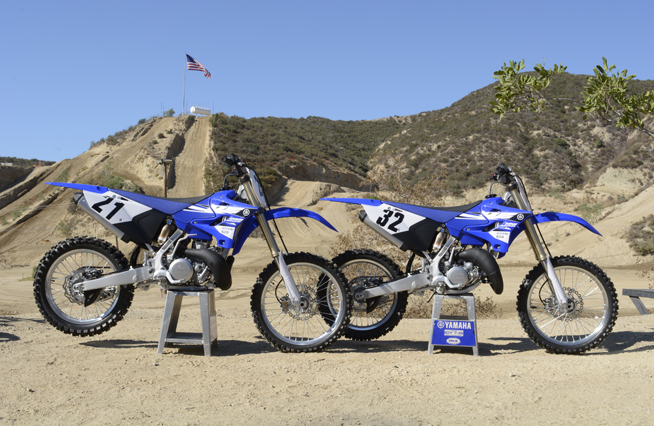 Yamaha still offers two of its most classic motocross models, the YZ125 and YZ250, and when we got the chance to ride them at Southern California’s Glen Helen Raceway, it was like stepping back 20 years in time. 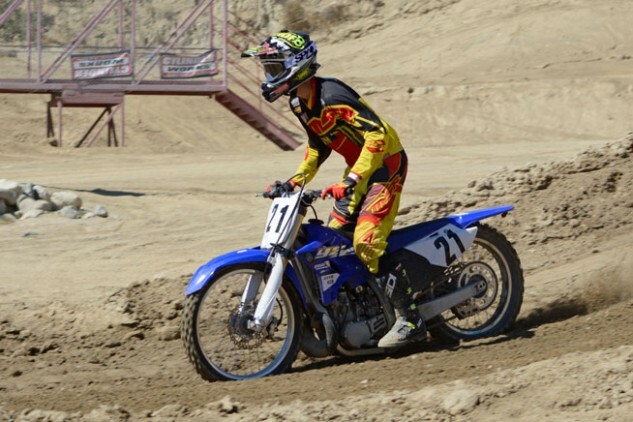 Yamaha rented the track for the day, and only had its two-strokes along for the event. Thus, there were no booming thumpers out on the track to spoil the blissful cacophony of screaming ring-dingers. The sound alone was worth the price of admission! Truth be told, since two-strokes have been out of vogue in AMA National motocross competition for a long time, no one could have blamed Yamaha for going the route of its “Big Four” Japanese competitors and dropping 125cc and 250cc two-strokes from its dirt lineup entirely, but a lot of enthusiasts are glad Yamaha didn’t do that. Their production numbers aren’t as high as they used to be, but motocross purists, two-stroke fans and dirtbike riders with a head for value still snap up YZ125s and 250s like there’s no tomorrow. Except that, in the case of the YZ two-strokes, there is a tomorrow. As if they hadn’t already proven it, Yamaha officials say that the company is committed to its two-strokes for the long haul. To shut down any doubters, for 2015, Yamaha is not only keeping the YZ125 and YZ250 in its lineup, but also the company has actually invested a few R&D dollars to upgrade both models, making them the best production two-stroke YZs the planet has ever known. The 2015 YZ two-strokes have received a major restyling to give them a more modern appearance. Save for the fuel tanks, the bodywork is all new. So are the graphics and seat covers. All-new styling from stem to stern is the most visible outward change. It gives the two-strokes a stronger resemblance to their four-stroke sisters. The front fender, radiator shrouds and graphics, number plates, fork protectors, airbox, seat cover and rear fender are all new on the two-strokes this year. However, there’s more to the 2015 YZ two-strokes than just new bodywork: Both machines get the latest 48mm KYB Speed Sensitive System cartridge fork that provides 11.8 inches of travel up front. A fully adjustable KYB shock with Yamaha’s slick, friction-reducing Kashima coating is bolted to a rising-rate linkage suspension system which provides 12.4 inches of travel out back. Internally, the two-strokes get different valving and lighter springs than the four-strokes. The YZ125 gets 0.42 kg/mm fork springs and a 4.7 kg/mm shock spring, and the YZ250 uses 0.44 kg/mm fork springs and a 4.9 kg/mm shock spring. 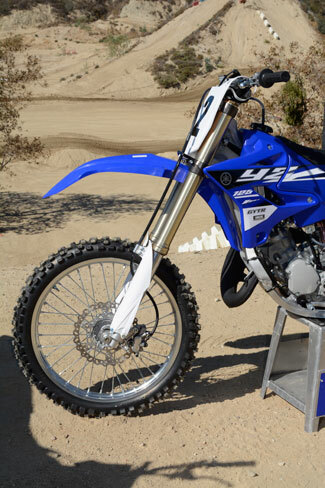 The latest 48mm KYB Speed Sensitive System cartridge fork found on Yamaha’s four-strokes has been fitted to both the YZ125 and the YZ250. Springs and valving are different for both machines. Both machines also get a new adjustable clutch perch that allows the rider to easily select a clutch lever position that is most comfortable for his or her hand. That’s a sensible improvement, as you’re liable to spend a little more time fanning the clutch on a two-stroke. Other minor updates include design revisions to the rear sprocket, rear brake disc protector and rear brake caliper protector. Still, it’s the heart of these premix burners that defines them. Their snappy power is classic two-stroke all the way, assisted by Yamaha Power Valve Systems (YPVS) that broaden their torque and power delivery by raising and lowering the exhaust port (and thus altering the engine’s compression ratio). 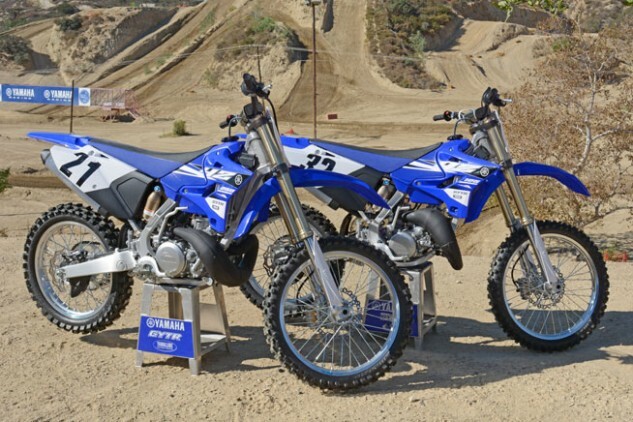 It’s interesting to note that, unlike their four-stroke sisters, the YZ125 and YZ250 both feature undersquare bore and stroke figures. The 125’s is just barely so, measuring 54.0 x 54.5mm while the 250’s is more pronounced, measuring 66.4 x 72.0mm. Just imagine how freakish the YZ250’s powerband might be if it carried the same 77.0 x 53.6mm bore and stroke as the YZ250F. It might give whole new meaning to the term explosive power! The YZ250 motor with its low-boy pipe is on the left, while the YZ125 with its more upward-routed pipe is at the right. Both machines still rely on good old-fashioned carburetors to deliver their premix through reed valves and into their respective combustion chambers. A Yamaha Power Valve System alters the exhaust port to broaden the powerband on both machines. As we learned with the help of our guest test jockey, reigning WORCS Champion Robby Bell, there’s really no need for further engine development to achieve more power. Both of these machines have plenty of beans for all but the hardest of hard-core motocross racers. The YZ125 is probably best suited strictly for motocross track use (although we’d love to get our hands on one and see just what we could do to make it an effective off-road bike), but that was just fine with Bell, who was having a blast as he threw the blue tiddler around the Glen Helen track. 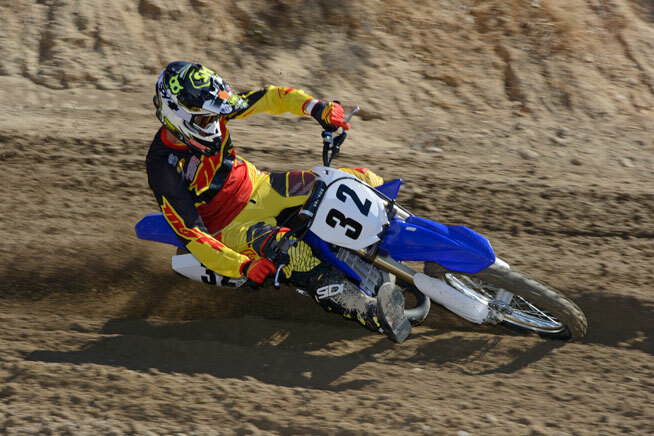 The YZ125 may lack displacement, but it can shred a corner with the best of them. 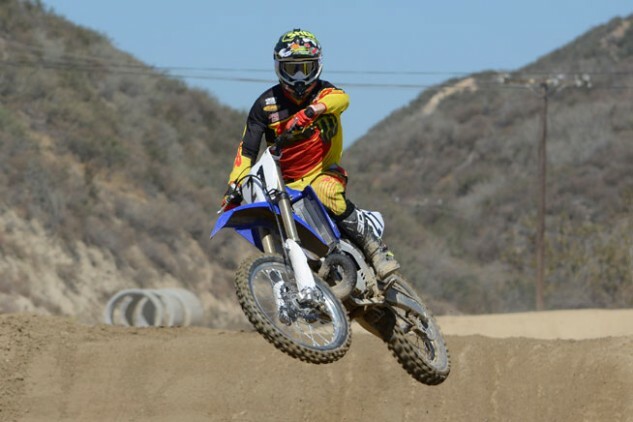 Reigning WORCS Champion Robby Bell said that he was surprised how the 125′s stout-mid-range and shrieking top-end allowed him to carry third gear through some of Glen Helen Raceway’s rutted corners. While the YZ125 is primarily intended to smooth the transition of young motocross riders coming off of an 85cc two-stroke, full-sized adults might be surprised at just how much zip the YZ125 has on the track. The beauty of the 125 lies in its ability to teach young riders the key fundamentals of corner speed and momentum conservation. It isn’t just fun to ride. It’s also a training tool that will make riders faster when they graduate to bigger, more powerful machinery. It’s also an excellent way to improve your speed on a bigger bike. It may sound a little backward to suggest that if you want to go faster on a machine with more displacement, you should practice on a 125, but it’s true. Philosophically speaking, a 125 can still play an important and all-too-often forgotten role as the perfect machine to help aspiring young racers transition from 85cc two-strokes to four-strokes. That additional “work” of which Bell speaks is really not work in the strictest sense but rather a strengthening of such moto fundamentals as carrying optimum corner speed and conserving momentum. Smoothness is the key to speed on a 125, and that translates to even more speed when a rider graduates to larger-displacement machinery. The YZ125 is the perfect tool for learning how to be smooth. 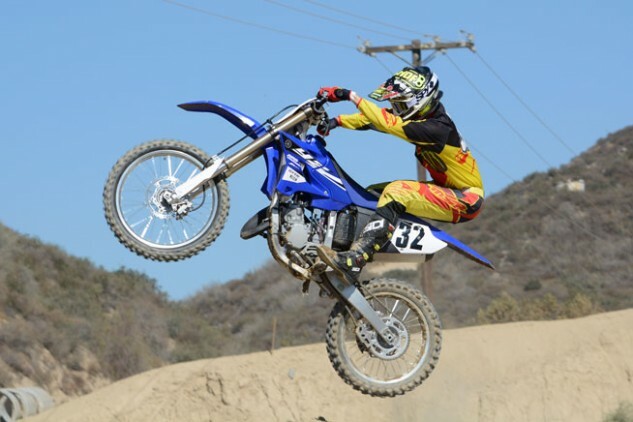 The YZ125 is an absolute feather in the air. That may be the easiest way to get the job done, but the four-stroke’s abundant low-end torque fosters a point-and-shoot style that won’t necessarily net a rider the fastest lap times. Naturally, the YZ250 allows the rider to be a tad lazier since it makes so much more torque and also doesn’t rev as high. For a two-stroke, it is surprisingly friendly in its ferocity. 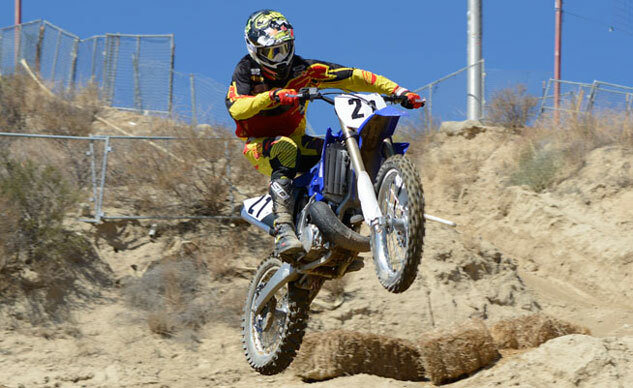 The YZ250 can still shred berms with the best four-strokes on the market. The key to happiness, says Robby Bell, lies in getting the most out of its ample mid-range power. Don’t shift it too early and don’t overrev it. Both machines feature fairly slick-shifting transmissions and smooth, linear clutches. The 250’s transmission is a five-speed, while the 125 gets one extra gear and closer ratios to help keep it singing within its narrower powerband. Bell said that both machines were smooth and positive during upshifts, but he did notice one slight annoyance with the YZ125 when downshifting. “Shifting down from third to second under braking on the 125 demands extra concentration to guarantee that the shift is made,” Bell said. The YZ250′s backbone-style aluminum chassis is stable at all speeds and extremely neutral in the air. Neither machine possesses Yamaha’s excellent bi-lateral beam aluminum chassis, but their traditional backbone-style aluminum chassis are far from over the hill. Bell was clearly pleased at how well both bikes steered, flew through the air and tracked through Glen Helen’s notorious ruts. Partial credit for the excellent handling is due the KYB suspension found on both YZs. It’s the same basic hardware as the excellent units found on the YZF models, which arguably puts it on the cutting edge among conventional spring forks. Yamaha has done a very good job of sorting out the SSS fork for its two-stroke models. Out back, the KYB shock holds up its end of the deal very well on the 125 but not quite as well on the 250, according to Bell. While Bell got along reasonably well with the stock suspension on both the YZ125 and the YZ250 (shown here), the fork and shock valving in both machines was a little soft for his tastes. “Suspension has never been that critical on a 125 to me because the bikes are so light to begin with, but the YZ125’s is really, really good,” Bell said. 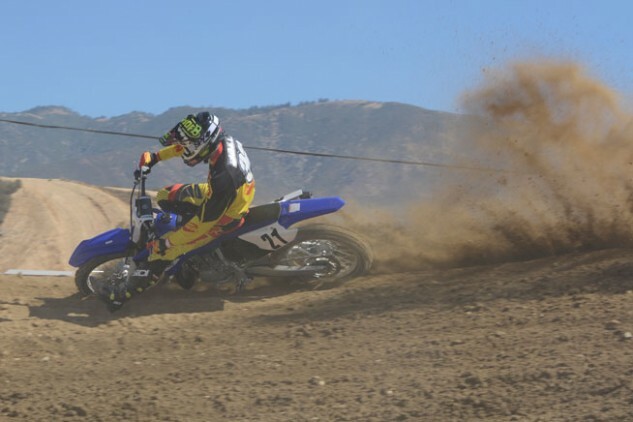 “I would maybe rework the valving just a little bit to make it a little stiffer for my weight, but overall, it was excellent for the conditions we had at Glen Helen. Both machines also boast strong brakes, with wave rotors at both ends. The front end carries a 250mm rotor with a twin-piston caliper. A 245mm wave rotor with a single-piston caliper gets the job done for the back wheel. 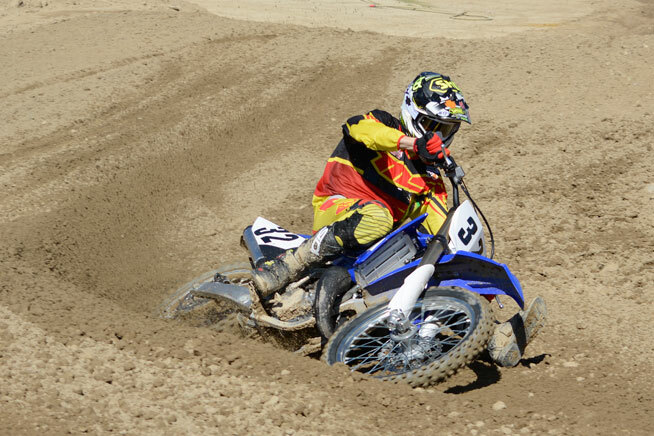 A screaming two-stroke and a deep track with plenty of dirt to shred. What could be better? Of course, you can’t have fun all day if you’re not comfortable. Both YZs were comfortable enough for Bell’s 6-foot frame. Their layouts are flat and narrow, their seats are slim with “gripper-style” covers that deliver plenty of traction, and both bikes offer the added adjustability of bar mounts that allow the rider to move the aluminum handlebar to tailor the riding position. Bell required no adjustment to be happy, but it’s a nice feature. We could go on about how the 2015 Yamaha YZ125 and YZ250 are as raceworthy as ever and how they offer excellent bang for the buck with the added bonus of lower maintenance costs thanks to fewer moving parts in their two-stroke engines. That’s all true, but at the end of the day, their strongest selling point was evidenced by the smile on Bell’s face. “I’m glad Yamaha still makes these bikes,” he said. coolant (as applicable) and a full tank of fuel.